TUCSON, Ariz. - An Arizona Department of Public Safety trooper intentionally collided with a wrong-way vehicle on Oct. 14. According to DPS, a trooper was assisting a stranded driver on the I-10 near Avra Valley. The trooper heard reports of a wrong-way vehicle traveling east within the westbound traffic lanes on I-10. The trooper found the wrong-way vehicle, approaching the car head-on near Cortaro Road. The trooper intentionally aligned the front left corner of his patrol vehicle with the front left corner of the wrong-way vehicle - forcing a collision that immediately stopped the wrong-way driver. 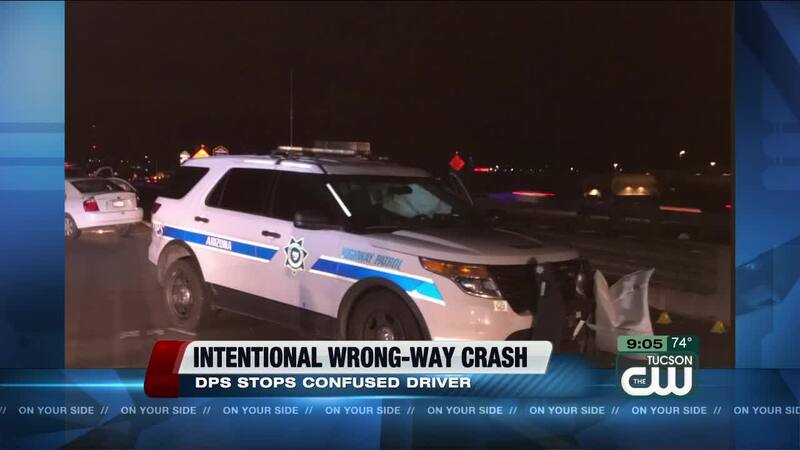 DPS said the wrong-way driver was a disoriented, elderly woman. She was not properly restrained during the collision and sustained non-life threatening injuries. She was taken to Banner University Medical Center. The trooper was treated for minor injuries.